Maryhill Museum of Art’s permanent display of Théâtre de la Mode presents post-World War II French haute couture fashions on one-third-life-size human mannequins. When it appeared at Louvre’s Museum of Decorative Arts in 1945, the Théâtre de la Mode opening drew 100,000 visitors. The exhibition toured Europe and the United States in 1946, before languishing in the basement of San Francisco’s City of Paris department store. The sets were lost, but the mannequins were saved through the efforts of Alma de Bretteville Spreckels, who championed their transfer to Maryhill Museum of Art. 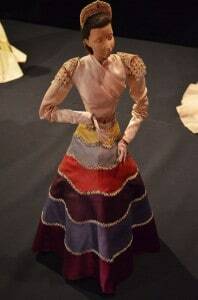 Maryhill is home to nine re-built sets and restored mannequins dressed in period casual and formal wear. Each year, three of the nine sets are on display. In 2019–2020, the sets and mannequins on view include André Beaurepaire’s “La Grotto Enchantée” (The Enchanted Grotto); Jean-Denis Malclès’ “Le Jardin Marveilleux” (The Marvelous Garden); and André Dignimont’s “Palais Royale.” All of the sets are based on original designs and were recreated by Anne Surgers in 1990.